Why was the invention of the printing press considered a turning point? 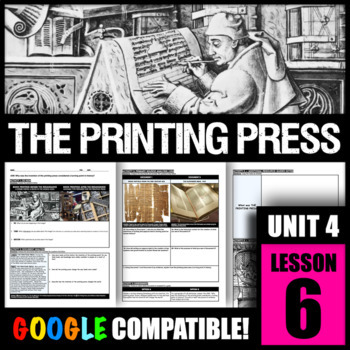 ACTIVITY 1 -- DO NOW: Students will read about the printing press and then choose an option to work either independently or in pairs. 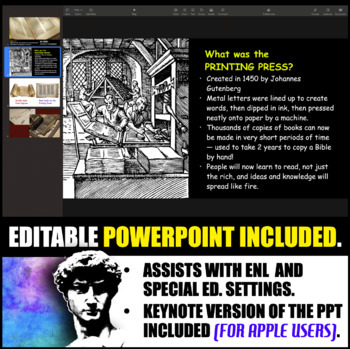 Options include a graphic organizer that compares the invention of the printing press to the invention of the internet and a dialogue between Bill Gates and Johannes Gutenberg to discuss the impact of their inventions on society. 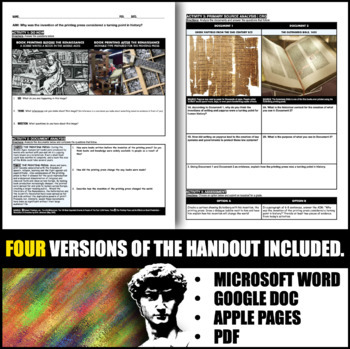 ACTIVITY 2 -- CRQ: Students will analyze a sheet of papyrus and compare it to a page of a book that was printed by the printing press.